A gorgeous new energy station is poised to dramatically slash the carbon footprint in one of London’s major urban development areas. C.F. Møller Architects completed the Low Carbon Energy Centre, Europe’s largest new build residential heat network in the Greenwich Peninsula. 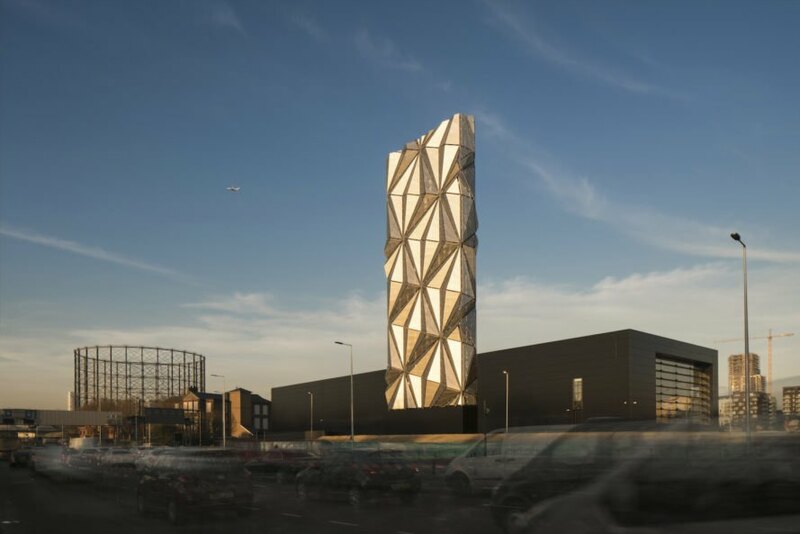 Created in collaboration with artist Conrad Shawcross and developer Knight Dragon, the Energy Centre is a crystalline landmark capable of saving 15,000 to 20,000 tonnes of carbon every year. The 3,000-square-meter Greenwich Peninsula Low Carbon Energy Centre is located at the highly visible entrance to the peninsula next to the Blackwall Tunnel Approach. 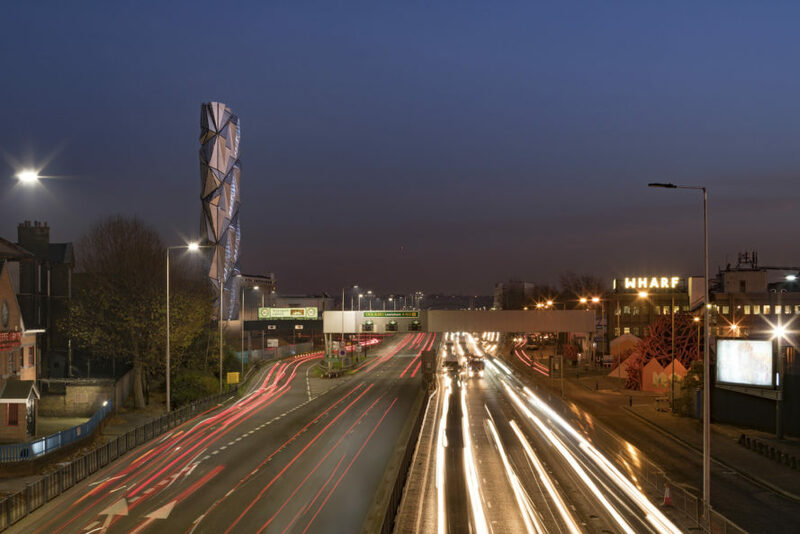 British artist Conrad Shawcross was commissioned to make the energy centre visually impressive with geometric cladding, called ‘The Optic Cloak,’ as a means to communicate the stakeholders’ commitment to sustainable and affordable energy for all. Clad in hundreds of triangular panels, the 49-meter-high tower is beautifully sculptural and plays with vanishing points and perspectives. At night, the building appears to glow from within as lights pass through the perforated panels. The Energy Centre distributes heat energy to Greenwich Peninsula via a District Heating Network (DHN). The process of energy generation and distribution has been turned into an interactive educational experience through a visitor center open to rearranged groups of visitors. The Low Carbon Energy Centre uses Combined Heat & Power and was completed as part of the Peninsula’s Sustainability Strategy. The 3,000-square-meter Greenwich Peninsula Low Carbon Energy Centre is located at the highly visible entrance to the peninsula next to the Blackwall Tunnel Approach. Clad in hundreds of triangular panels, the 49-meter-high tower is beautifully sculptural and plays with vanishing points and perspectives. At night, the building appears to glow from within as lights pass through the perforated panels. The Energy Centre distributes heat energy to Greenwich Peninsula via a District Heating Network (DHN). The process of energy generation and distribution has been turned into an interactive educational experience through a visitor center open to rearranged groups of visitors. The Low Carbon Energy Centre uses Combined Heat & Power and was completed as part of the Peninsula’s Sustainability Strategy.